Last month after coming back from Calcutta we all fell sick. First it was the baby who suffered from viral fever and infections for almost a month, then it was hubby and finally me. I spotted the sick feeling in the beginning and swallowed my trusted medicine with green tea, which helped me to recover fast. But the problem with fever and cold is, it leaves you with a loss of appetite…whatever you eat feels like grass in the mouth. The only respite is something sour that tingles the sore taste buds and make you feel like having a full meal. But the weak me with a nagging baby in tow hardly had any time to cook something exquisite. Then I remembered this recipe called Kara Kuzhambu from a very talented Blogger Prema. This recipe has all the ingredients to nurture depressed soul and tasteless tongue. But the most important promise is the ‘maa ke haat ka khana’ or the taste of mother’s recipes. It bowled me over and I went on making this. Kara kuzhambu means spicy gravy in Tamil and mostly it is cooked with drumsticks and brinjals. But I didn’t have drumsticks at home and on a laidback weekend nothing would make hubby to go out and buy vegetables. So I decided to give it a miss. Finally with the brinjals from my veggie patch and some pearl onions, I was all set to make my spicy tangy Kara Kuzhambu. After half an hour of pressure cooker hissing, mixie churning and tung tang of spatula touching kadhai the meal was ready. The final outcome is not as drool worthy as Prema’s and I don’t blame her if she finally decides to disown my dish…but trust me that was a fabulous meal. The colour is black as I cooked with my 2 years old tamarind. We loved the sweet-sour-hot gravy with a very appetizing aroma lent by sambar powder. Combined with my trusted tomato dal, roasted papad and salad it brought our taste buds to life and we enjoyed our meal immensely. In a mixing bowl add all the kuzhambu spices and mix them well using hand, make it smooth without any lump, if it’s very thick add 1/2 cup of water. Mix and keep aside. Heat the oil in a kadai and temper with mustard and fenugreek seeds. Once it crackles, add curry leaves. When the beautiful aroma arises add the small onions and sauté for a minute. Now add all the veggies, salt and tomato. cover and let it cook on low. Once the veggies are soft and cooked cooked, add the kuzhambu spices. Mix well and again cover to let the veggies seep the taste and aroma. once the raw smell of the spice powders are gone and the gravy becomes thick, transfer it into the serving bowl. Wash and Pressure-cook the lentil with water (2 cups) the tomatoes and turmeric for 2 whistles. Let the pressure dissipate in itself then open the lid. With a spatula mix the tomatoes to the lentil. The consistency would be smooth and soup like. So if needed add more water. Heat the oil and temper with mustard seeds, torn chilies and curry leaves. Once it splutters add the onion and fry for a minute. Add the lentil. Add salt and sugar to balance the tartness of the tomatoes. Bring to boil and serve with rice and curry of your choice. To Bookmarked Recipes - Every Tuesday Event - 5 October 2010 - Volume 10. this month hosted at Aipi’s US Masala. MLLA#28 the event started by Susan of The well seasoned cook and this month hosted at Divya’s Sil se. South Indian Spicy curry, chettinad curry, chettinad vegetable, spicy gravy, Indian gravy with sambar powder, Tomato lentil, tangy lentil with tomato. red lentil soup, red lentil cooked with tomato, curry leaves tempering, spicy gravy dish. side dish with rice, Bengali lentil, bangali dal, eggplant curry. 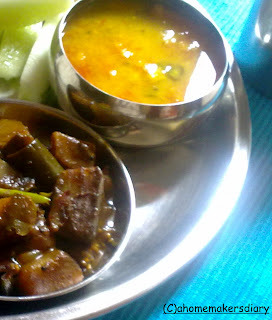 Indian spict eggplants gravy, vegetables in tangy spicy gravy. Inviting platter.. looks too good.. thanks for sharing dear !! Sayantani...you reminded me of my childhood days! I love kara kulambu. Lovely platter. Lovely dish!! even the name is so melodious!!! curries looks awesome satyani. I love to have it for my lunch. that looks like an amazing meal.. very new n interesting recipes.. the beauty of blogsphere we get to learn so many new things everyday..very nicely done n presented Sayantani! Looks delicious and healthy meal..
Never tasted kara kuzhambu before, looks super-tasty..Loved the dal too..
Sayantani, Thanks for your sweet comment! and wait for the end of this week, I'll be hosting a giveaway for my international readers as well. i would have combined the two, but it would have made sorting through the comments very messy. also wanted to say that your tamatar dal looks heavenly. Hubby and I are big fans of south indian cuisine and I loved seeing the mom-made :) kara kuzhambu. I always keep frozen drumsticks in my freezer (along with frozen curry leaves) so I can make south indian food whenever I want to. MOuthwatering kara kuzhambu, i make them once a week, love tangy gravy anytime, comforting tomato daal. OK this is a must try, am going to have to make it on Sunday - my rice eating day - instead of my usual rajma chawal! Sounds and looks absolutely delicious! I like the dal...so simple! Something like our tok dal. Yum, yum, both dishes are looking delicious! 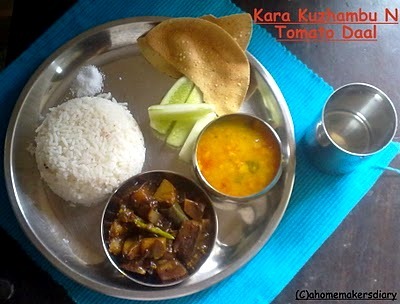 Nice combo,love kara kuzhambu anytime,I prefer it than sambhar,tomato dal too sounds great! This kuzhambu looks delicious ...tomato dal is regular yellow dal at my place but this spicy kuzhambu is different. regarding your querry about the green idli...I make this idli by placing the bowl directly into the microwave oven , covered but not immersed in water bath . 1 minute for a medium sized idli and upto 2 minutes if a large or extra large idli is steamed , you can make individual idlis this way and not in batches , as microwave tends to dehydrate the idli or anything for that matter. For the two of us i make 2 large idlis and that's it . As i said i have actually forgot using my tupperware plastic idli steamer , this way it is so much more convenient . Pujo te ki korcho Sayantani? ekahnei thankbe? Delicious platter...will try ur kara kuzhabu..
Tomar recipe diye aajke kara kuzhambu try korlam. I also added a little jaggery to balance the sourness of the tamarind. Bhishon tasty hoyechhilo. Thanks for posting this recipe. Sayantani,thanks for your kind words. It means a lot to a new blogger. Your blog is a real inspiration to me. 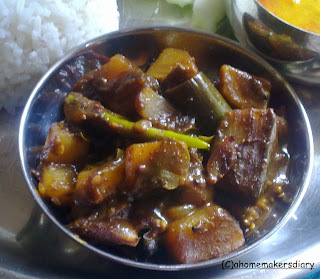 Tumi eto shundor lekho ... aar recipe aar photo gulo eto bhalo ... mone hoy shob kota try kori. Sorry to hear that you were all sick. Hope you are feeling better now. This dish sounds so appetizing - a little spicy and tangy. thanks everyone again for so much response. @Pree, akdom amader tok dal er moto kheteo hay. @Madhu thanks for trying this.